Eugene teaches the kids about shelter building. Our popular Young People’s Weekend returns! Last year’s event was wonderful! For two days young people in our community came together to learn new skills (including survival skills), rekindle friendships, and boost their confidence. We’re hoping to repeat that success this year. 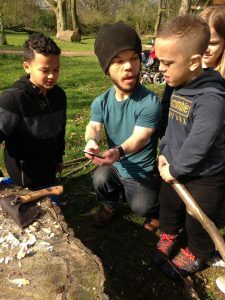 We’ve booked the fantastic Rock UK Frontier Centre, Northamptonshire (https://rockuk.org/centres/frontier-centre/) and there’ll be tonnes of activities to keep you / your child busy! Open to RGA UK members, kids between ages 6 to 18. Interested? Get the date in your diary and email office@restrictedgrowth.co.uk to register your interest. You must be a member of RGA UK to attend.